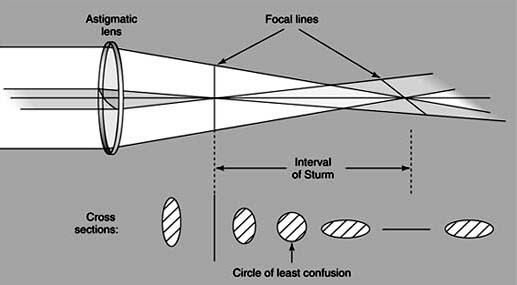 To understand the clinical application of Conoid of Sturm,we need to understand its basic optics. In simple words, we can say ” Conoid of sturm is just a representation of how rays are refracted through two different powered meridians” (eg:a sphero- cylindrical lens). So ,instead of one focal point they form two focal lines. When light rays fall on an astigmatic lens (sphero-cylinder lens) , light does not focus on to a single point instead forms two or more focal lines. The light rays which hit the lens horizontally form a vertical focal line ,so, a point image appears as a vertical line. The light rays which hit vertically form a horizontal focal line ,so, here a point image appears as a horizontal line. Focal interval of sturm: The distance between sagittal and tangential focal lines is called focal interval of sturm i.e gap between the vertical and horizontal focal lines. The images formed here are blurred circles of different sizes. In between these two focal lines, we can find a circle with best overall focus (but still little blur) called as Circle of least confusion/diffusion .It occurs exactly midpoint between the two focal lines. Let us see the optical effect of a Conoid of Sturm practically. Take a high plus cylinder lens(+10.00 or more with some cylinder) and focus the sun on the ground. At one interval you will see a thin line focused, at another you will see another thin line 90 degrees opposed to the first. Now if the lens is held at a distance halfway between these two focii, you will see a little focused circle i.e circle of least confusion. This concept of Conoid of Sturm happens when there is astigmatism present in the eye. It is corrected with sphero cylinder lens in such a way that the circle of least confusion is placed on the retina making the image clearer.